If ambrose join derby i urge him to do so. Ambrose is already 30, he is trying. Nacho also have some good games under the jersey of Leicester . I should remind others people on this thread that Christian benteke scored 3 Epl goals last season in about 30 games and he has not been killed. Wetin concern Benteke with Iheanacho? You and I know that this is absolutely not true. Which game changed? Iheanacho touched the ball six times in that game, missed a simple control(although the ball did come at him with pace). You miss a pen that could have made it 1-1 and the other team makes it 2-0 so how on earth did were they on top for the whole match? Exactly 5years and 24hrs ago, Sunday Mba became a hero in the history books of Nigerian Football faster than many that were well placed in careers than he was. Cant forget Pineapple head and Pitroipa and their coach that was obviously scared of our Late Big Boss during his press conference. i miss Vincent Enyeama now. Sometimes i do wish the NPFL clubs open up auto chances(not totally auto, but at least for these players that are passionate to go far), for nigerian players that have retired from active club football in europe and the likes. Let them come and invest in our league and watch the morale boost our ratings. Almost all of England's 2002 world cup team are now club managers. but we cant boast same. even if its some sort of mutual agreement of sorts, let it just happen. some players would love to see Yakubu, Osaze, Yobo, Aghahowa etc be with them during training and help them improve. 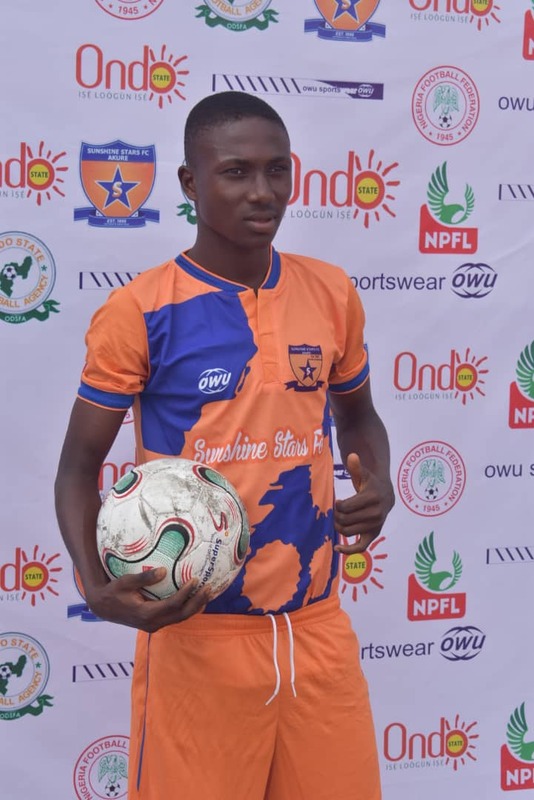 NPFL "14 year old" Ayo Adejubu of Sunshine Stars. why do we lie so cheaply in this country. Person wey I talk to get sense so e no go ask this meaningless question . I'd rather compare their forms.. This is Odey's second season in Europe and he's been outstanding.. Eleke too! Akpom on the other hand has been a "promising player" for as long as we can remember!.. He's been in and out of the lower division of English football without making a headway.. He's in form right now,but I'll give him more time..
he should rather play for the u-23 like tbaba suggested..
As for their clubs, is the Greek league better than the swiss league?? Bro...that Greek league is not beans oooh. my respect for that league grew...the day I watch Athens beat Club d Brugg silly just about 2-3 year ago...in the Europa league..
abi the place don taya you, sotey u sef no wan even peep again? Iheanacho won't lack offers if he decides to leave Leicester, that one is certain ... But you have to consider that with his current form, he would only attract interest from lower clubs with a system of play that's even worse than Leicester's. Don't try to compare Iheanacho situation to other player's abeg!. Iheanacho has been given enough game time this season but hasn't delivered! He is in very poor form right now! And finally,don't forget that Iheanacho's biggest fan (you know who ) has stated that he needs to play under an attacking system that suits his style for him to flourish! So the big question right now is "Is there any club in Europe with a system that suit Iheanacho that will be willing to sign him with his current form?" You have mentioned West Ham who is he going to displace, on his current form he can not displace any of thier strikers. If he plays as an AM he can not even displace Nasri. You are relying on the sentiment of relationships past with Pelligrini that's clutching at straws. There is no team in the EPL that will buy a player who has been essentially impotent for two seasons. Add to that his over inflated wages. Who will pay £75k a week to a player who has scored one goal in the EPL all season. I think one thing is CERTAIN no team in the EPL will take a player who has failed for two seasons. He will not get any offers in the Championship he simply doesn't have the physicality to cope and technicality required. Because you own the club or wetin? He will not get any offers in the championship? Your waste man solanke still joined Bournemouth,not surprised sha because na English player, he should enjoy Bournemouth bench as he can't displace callum Wilson or the other guy . Wait. Did. Leicester outplay Tottenham or not? Give me a direct answer. you spit from both sides of the mouth, you saw the pace of the ball but still expect him to control it as if it was a back pass. The ball was actually a cross which wasn't meant for him. He intercepted it meaning he thought he could control it. Which is why I said he missed the control although in his defence it was coming in with a lot of pace. How is that difficult to understand? This is the only thread I frequent on nairaland. I even hardly visit a live Super Eagles thread when we play games not to talk of the Arsenal thread. Just a time management measure. So does he look it or not? I even thought he was 12 years old his very young. Unfortunately and fortunately for Solanke thier is a perception that he has GREAT POTENTIAL. He has not been tested and proven beyond the accolades of national U21 football in my opinion. That gives him the benefit of the doubt it seems. Otherwise it seems ABSOLUTELY incomprehensible how Bournemouth could have paid near £20 million for him. I still don't think he is anywhere near that. Solanke is a striker and nothing else but with assumed great potential lacking opportunity at Liverpool. Unfortunately for KC he lacks definition what is he a striker, SS, AM, nobody can really say what he defines him. He has no unique selling point to give himself value. He was bought as a striker with great EXPECTATIONS for £25 million. Two seasons later and 4 goals in the EPL he has been TESTED, PROVEN & GIVEN OPPORTUNITY he has been a big DISSAPOINTMENT. He no longer has the benefit of the doubt as possible POTENTIAL. He is looked upon as MEDIOCRE. You are making excuses for the inexcusable he got less minutes because he failed to perform. He played a lovely league two team and struggled when given opportunity. My honest opinion is that he needs to find a way to redefine himself. Because he is not a striker that's his first problem and until he does that he will find very few clubs interested in him. I am sure you must know some of our players who have retired recently. You should know our people and our mentality. Nothing u say will change the fact that they were down 2-0 when Iheanacho came on the pitch. I don't care how good u played, when you are down by 2 goals late in the second half you are as good as buried. They were out of the game and his substitution brought them a life line. He was played on the right and the goal came from that side. Everyone could see that they only got joy from the right side. The boy did a good job and I will acknowledge it no matter what you or anyone else say's. Haba which kin cross comes to a players leg? Was it the over 6 foot CBs that he expected to get that kind of ball over? It was clearly an over hit pass. Iheanacho had zilt to do with the goal or the play coming from the right side, for goodness sake you are not being realistic. The black fullback Pereira was the only reason why something good was coming from the right side, maybe you thought that was Iheanacho but no it wasn't. He created the goal after a one-two with some white player like that, can't really remember the name now, Iheancho on the other hand was standing next to Rose all game long and had nothing to do with the creativity from the right. You are making it sound as if he came on and created a goal, the only meaningful thing he did was a shot which didn't trouble the GK, his movement improved though and even his touch but saying his substitution brought life back into that game is absolutely false IMHO. It is called a ground cross, it was from a similar cross that Leicester actually scored. Did you actually watch the game? Why would someone want to get a ground cross over the CBs? Who in his right mind will even be trying to find Vardy with a high cross when he is behind those tall guys? To make it clear to you, the first goal was scored from a ground cross. There was a chance which Vardy peeled away and volleyed over the bar from a similar ground cross, then the one Iheanacho intercepted was a similar ground pass. It was clear that Pereira was instructed to deliver low balls into the six yard box which he did to perfection and created all Leicester's chances late into that game.